I have been a little obsessed with cutouts lately, I'm not sure why. I put together a Pinterest board and the one that really struck my fancy was this (at right). And of *course* it had to be just a hosted image, with no link, information, back view, or front view without her hair covering the shoulders. But I got the gist. 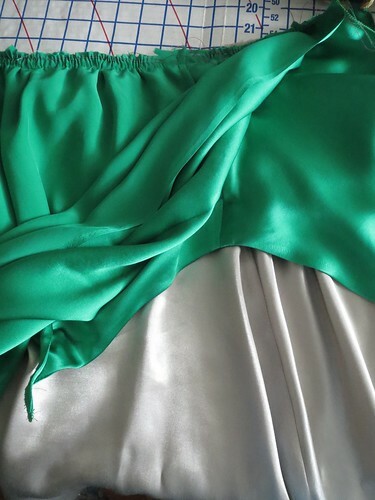 I decided to make my birthday dress out of some gorgeous green silk I picked up at Paron in New York in August. 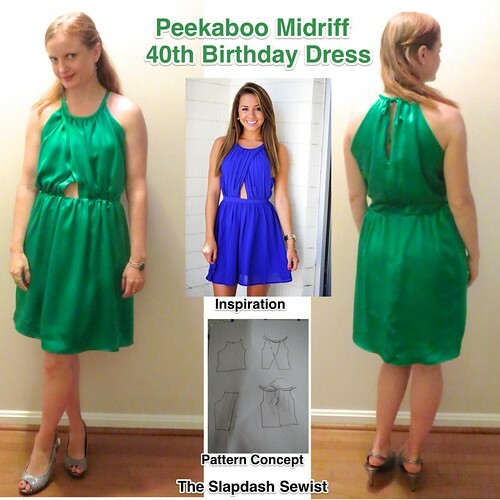 The color is that of the famous Atonement dress, but having neither Keira Knightley's willowy body type nor the Gatsby existence calling for full-length green silk gowns (nor enough fabric either--I just barely eked this out with nothing to spare once I made my self bias tape), this dress it was. 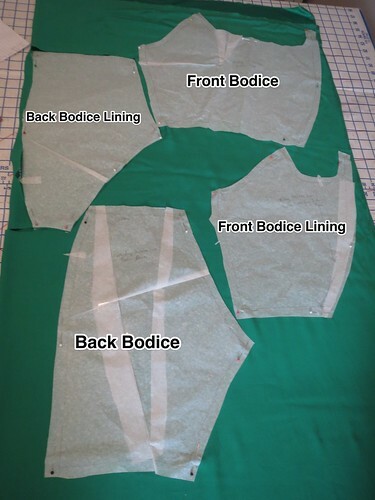 The first step was drafting the bodice. 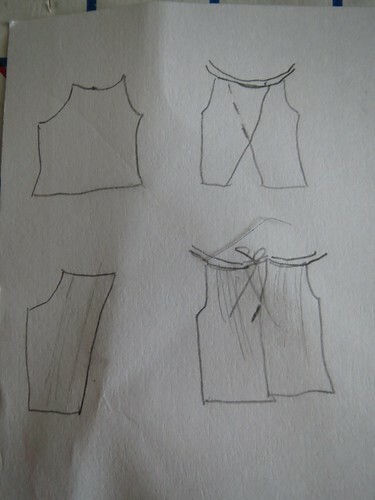 I drew up what the pattern should look like (sadly, I do not have a future career in fashion illustration!) and went from there. 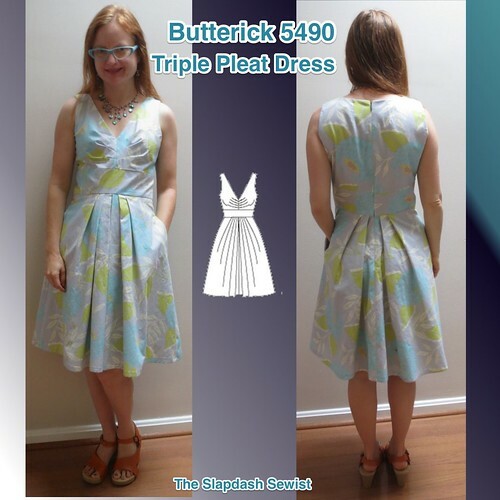 I considered starting with McCall 5880, which has the right shape at the armscye as well as the look I wanted for the back. But it has an empire line, which I didn't want and I decided it would be more work than starting from scratch. Then I remembered that I had turned my woven tee into a raglan version using the same method as for my knit tee. Perfect place to start! 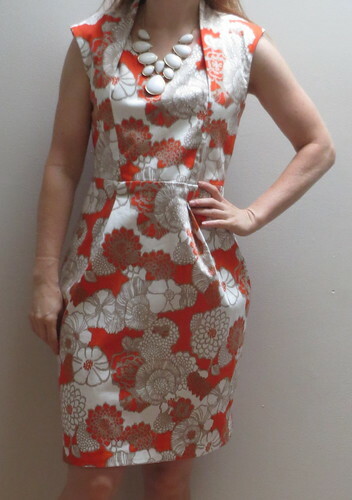 I first created a full width front pattern (rather than cut-on-fold). 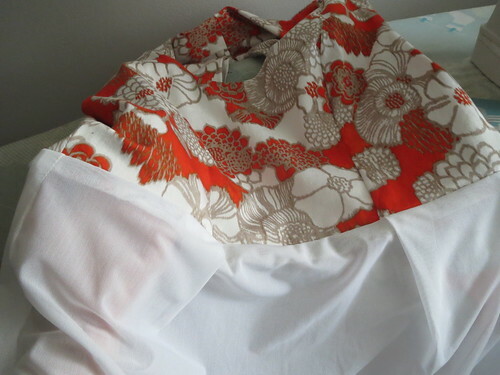 I narrowed the front neckline 1/2 inch on each side. 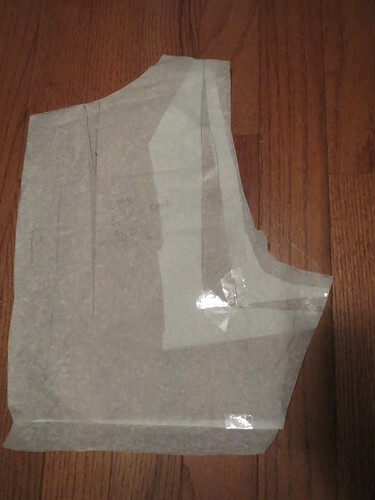 I marked 2 1/2 inches on each side of center front at the lower edge for my cutout. 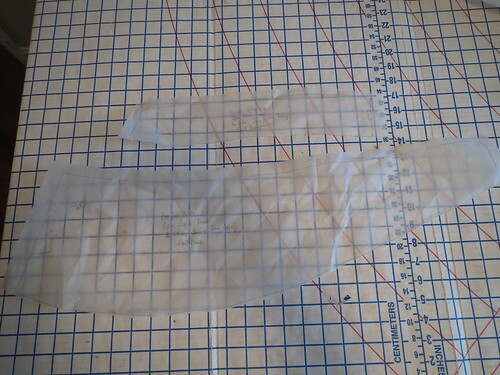 Then I made a diagonal marking from the corner of the neckline to my 2 1/2" mark. 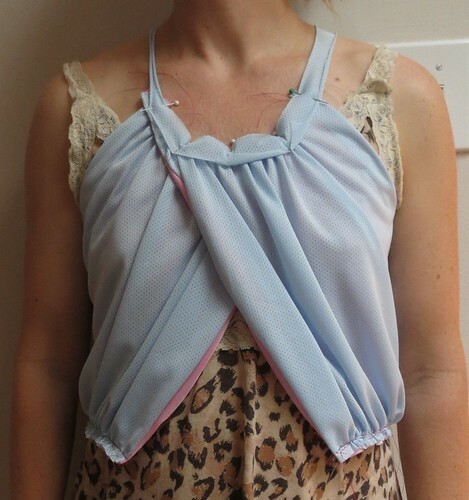 I mocked up a quick muslin of the bodice front, using hair clips and pins to attach it to my raglan blouse and tried it on. Whoa. The opening was a bit much. You can't really tell from the top laying flat, but we were definitely in bra-flaunting territory. 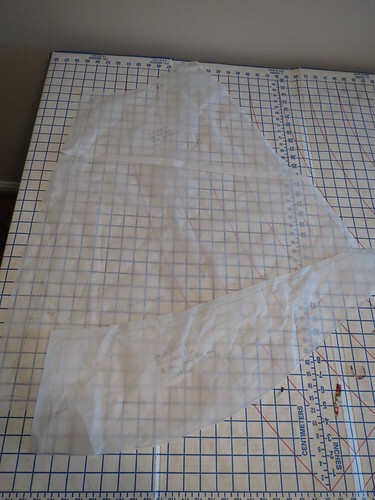 So for muslin #2, I narrowed the width from center front to about 2 inches on each side, and rather than cut a straight diagonal line I curved it a bit to give more coverage. 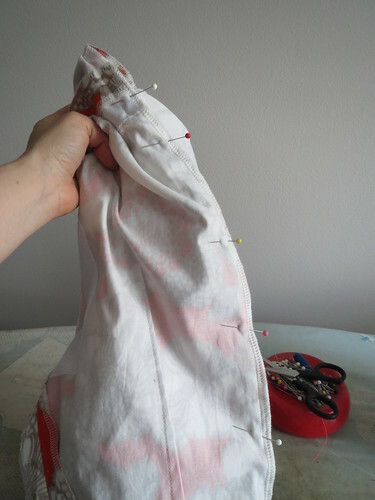 This muslin was what I was looking for, so I moved on to the drapey part. 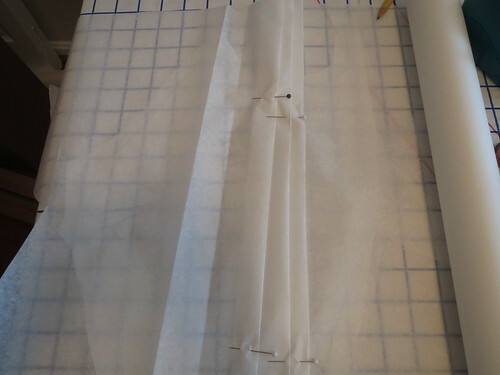 To get volume in the front, I first folded out three large pleats in my tissue paper to build in volume, then traced my pattern (the original pattern became the lining). 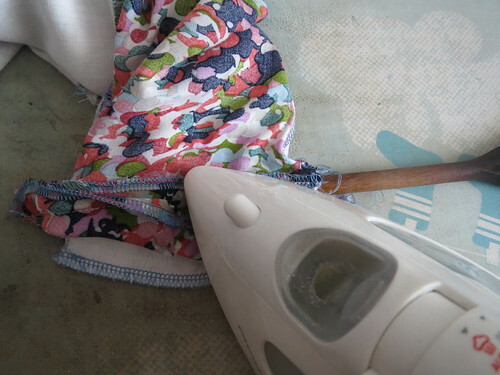 I didn't have any particular measurement of volume in mind, so I wasn't too scientific about my pleats. 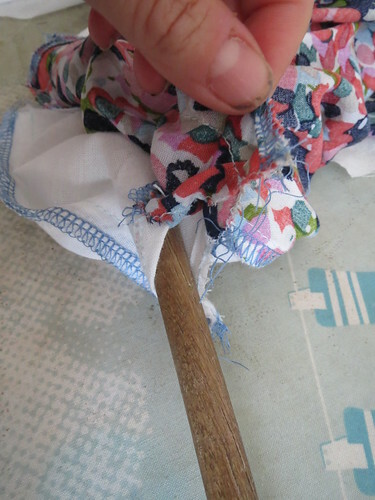 Each pleat was probably about two inches wide (so, encompassing four inches of tissue because of the folds). 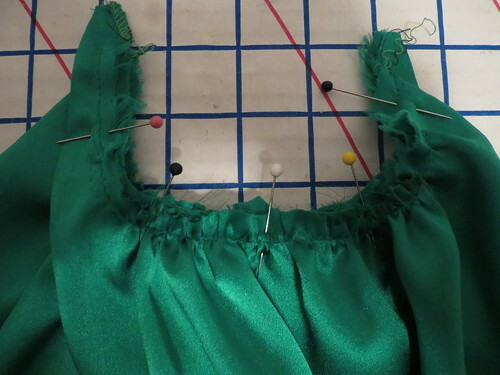 I also rotated the bust dart to the neckline. 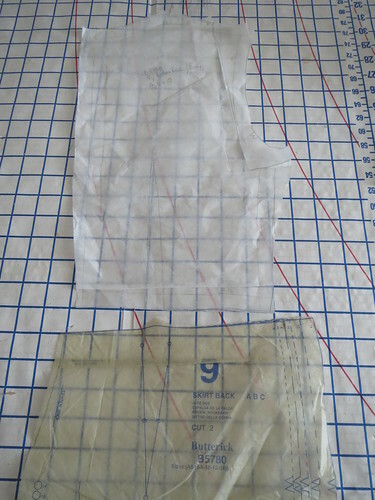 For the back, I made a diagonal cut from the neckline to the hem and added a wedge of tissue paper, as I didn't want additional volume at the back waist. 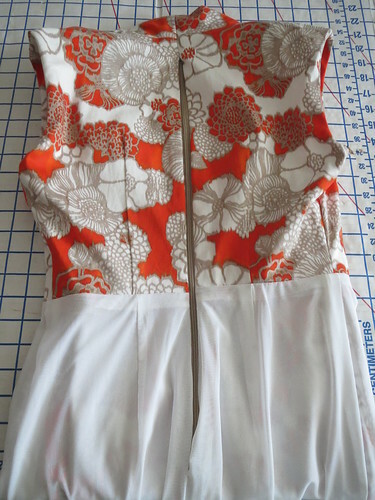 I cut out muslins of the front and back overlays and made a quick mockup of the full bodice--pretty much exactly what I wanted! 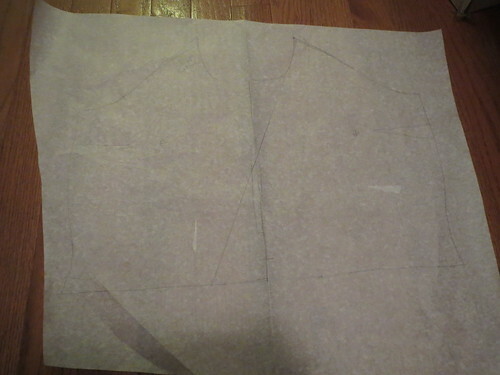 The pattern drafting process ended up being much simpler than I expected. 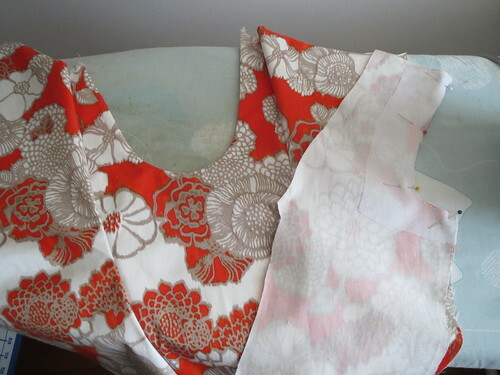 I cut the bodice and bodice lining from the fashion fabric because I didn't want the lining to roll over and show anywhere. 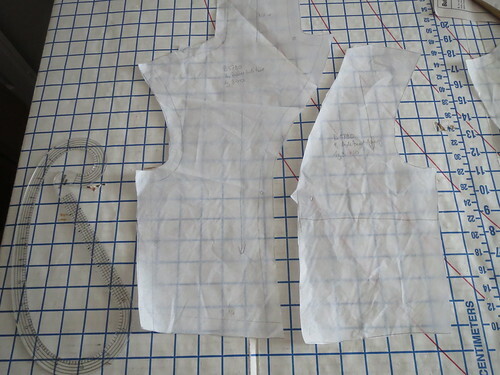 Here you can see what the final pattern pieces looked like for the bodice. 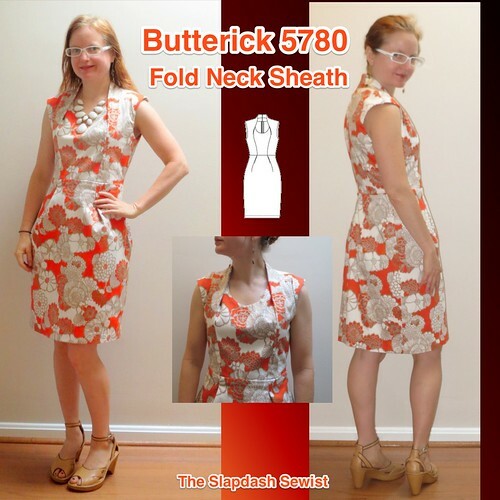 I used the skirt from Simplicity 1796 and I cut the skirt lining from Butterick 5315. 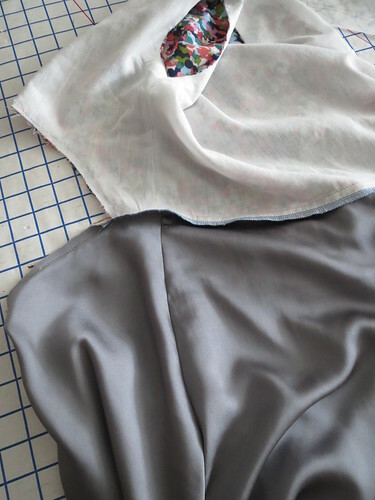 For the skirt lining, I made a facing for the center front at the opening, so there wouldn't be any lining show through. Construction was pretty simple. 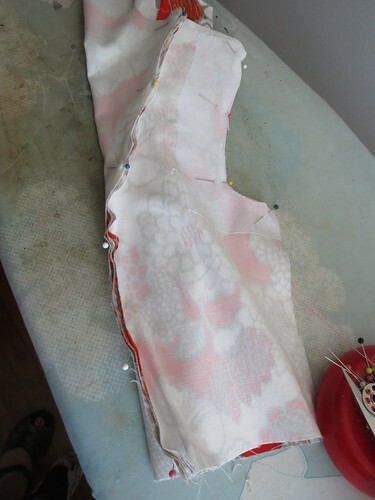 I started by sewing the side seams of the outer and lining pieces. 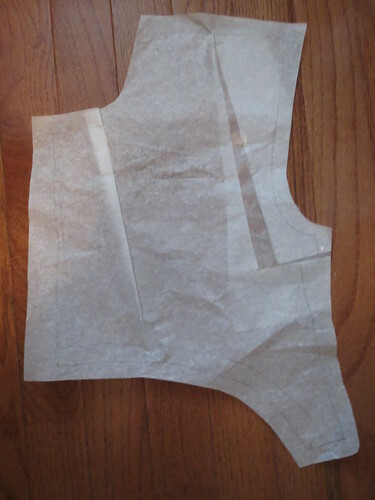 Next, I sewed the outer pieces and lining together at the armscye, diagonal center front, and upper center back, and turned and pressed. 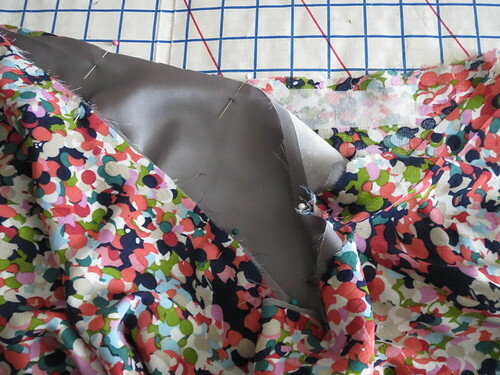 Then I put in the basting stitches for gathering on the outer pieces and pulled the gathering threads to match the outer piece with the bodice lining, basting the outer fabric to the lining fabric at the neckline and the lower edge. I left the lower edges separate about 2 inches from center back. 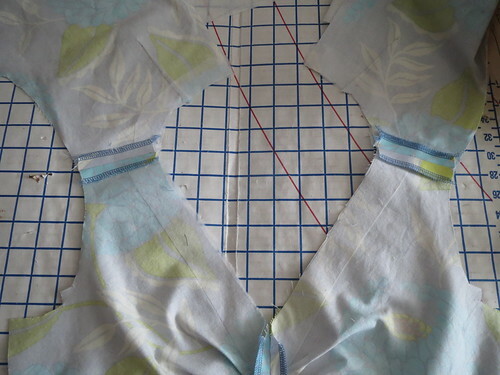 Once basted, I matched up the centers front at the neckline and pinned the left and right halves of the bodice together. To finish the neckline, I used self bias tape. 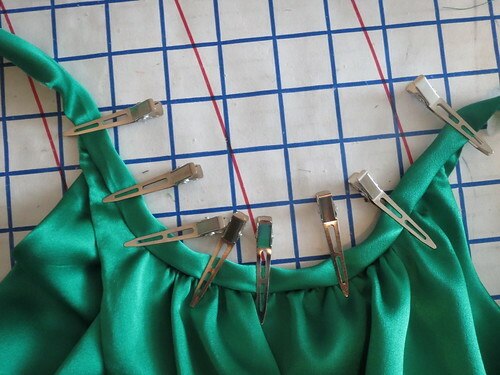 Because the entire weight of the dress hangs from the bias tape at the shoulders, I reinforced the shoulder areas with interfacing. 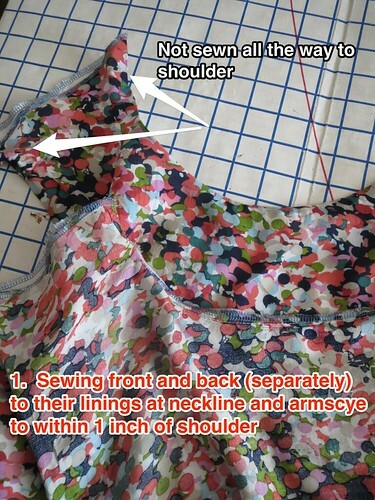 I first sewed the bias tape to the wrong side of the bodice. 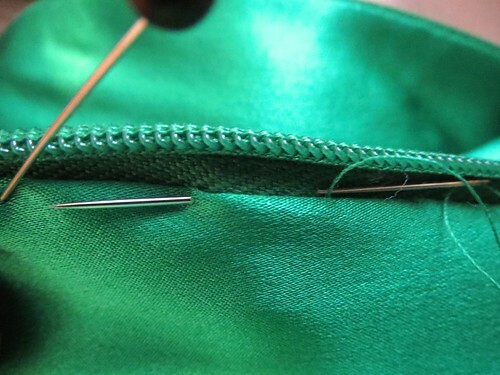 At the corners of the front neckline, you need to sew the bias tape to the very lower edge of the corner so that the raw edge will be fully enclosed. 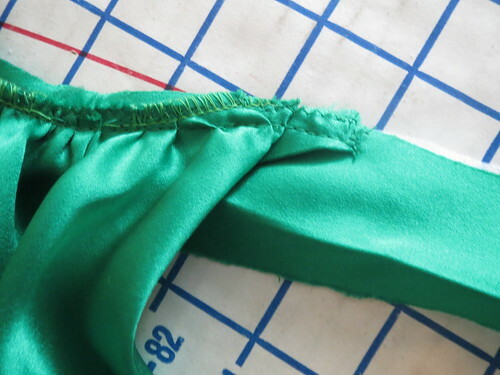 I then turned the bias strip to the right side and used the hair clips to hold the bias tape in place so I wouldn't leave pinholes in my gorgeous silk. 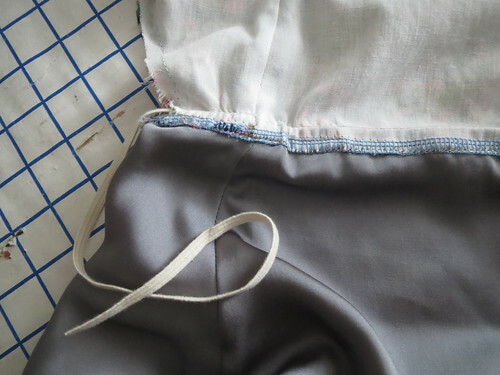 The skirt and lining were constructed separately with french seams at the side seams. 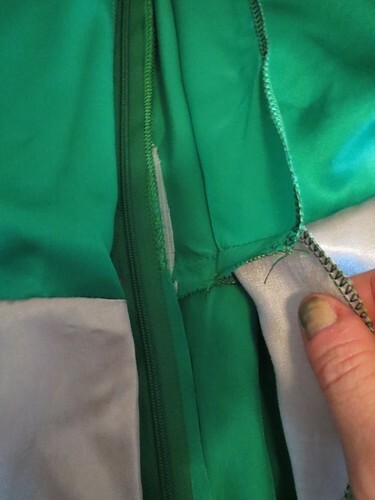 The center back seams were left open in order to sew in the zipper. 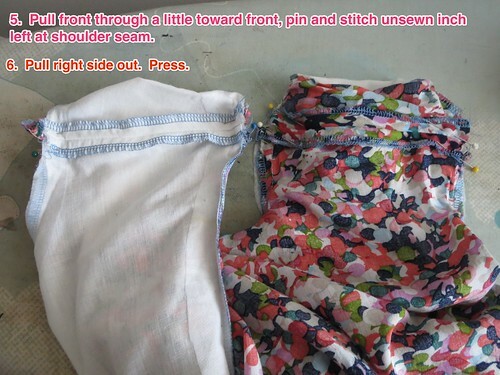 I gathered the outer skirt at the waist. 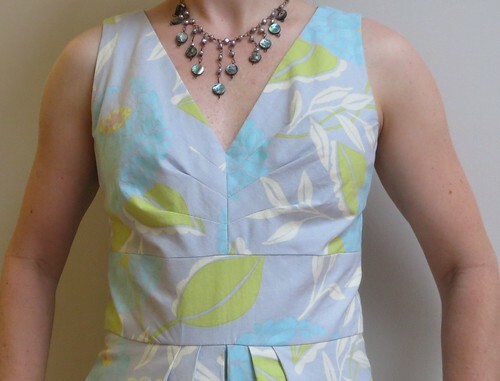 The skirt lining is an A line fitted at the waist to reduce bulk. 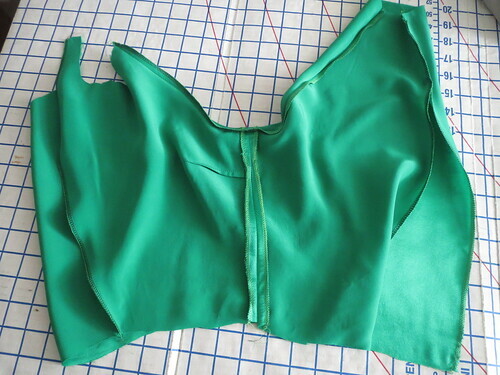 To join the bodice and skirt, I sandwiched the bodice between the skirt and the lining and sewed together at the waistline, leaving the last two inches before center back open--this was for later doing a neat finish at the zipper. 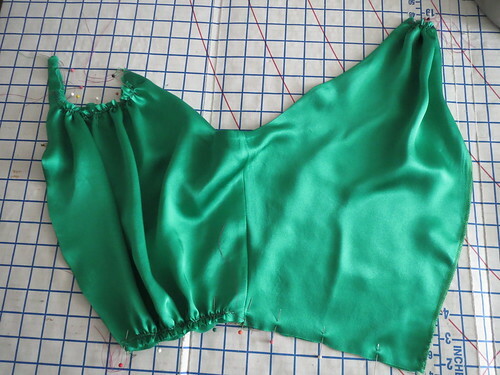 I separately sewed the outer skirt to the bodice all the way to center back, leaving the lining free. 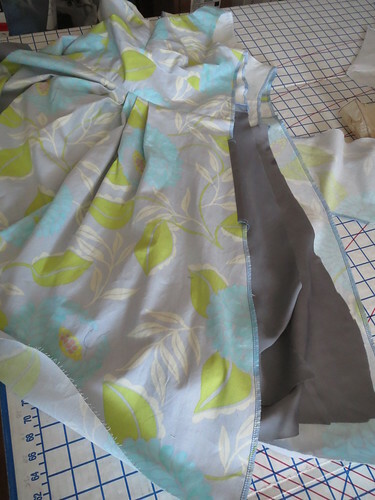 Then I sewed the skirt lining to the bodice lining all the way to the center back. 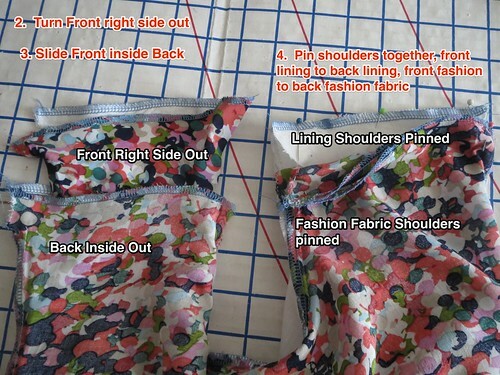 After reinforcing my fabric with strips of interfacing, I installed an invisible zipper below my finished center back neckline opening. 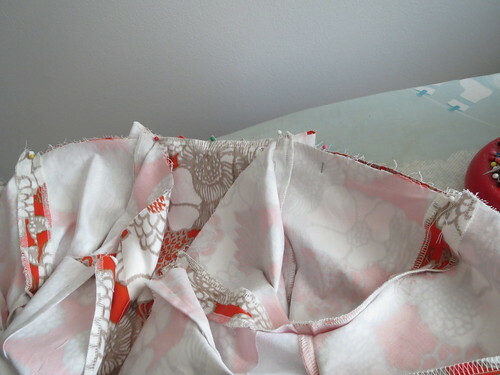 I had not been quite sure how I was going to finish the lining at the center back, but luckily it all worked out well! 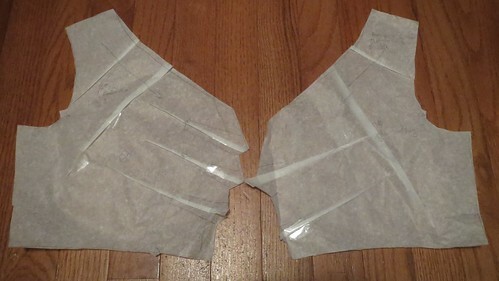 Remember that I had left the lining and the outer pieces free for the last two inches before center back. 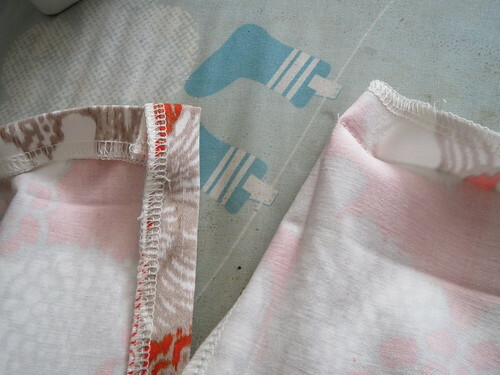 I folded the edges of the lining in and then hand stitched with tiny stitches to the zipper tape. 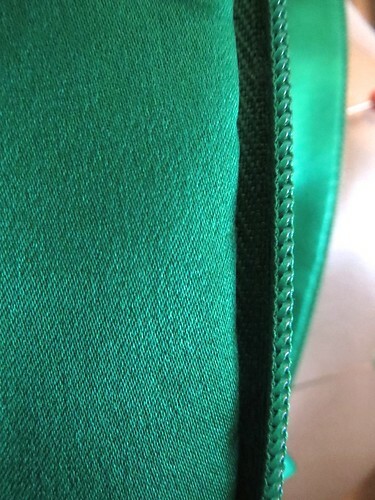 The finish is very neat on the inside, and the hand stitching is only barely visible. 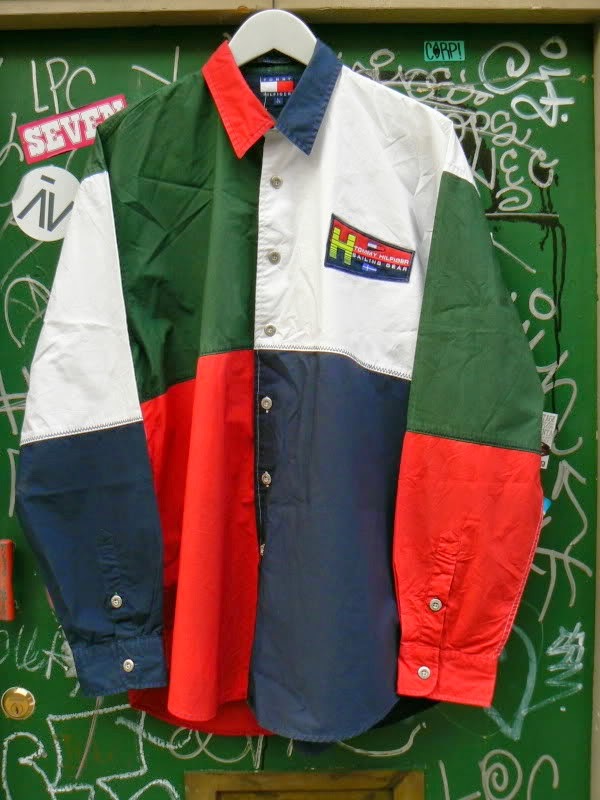 I was thinking this style was a departure for me, but then I remembered I made a knockoff very similar to this in 2007 (though apparently never blogged or PR reviewed). The seven years later version shows less skin, though. Still, I guess that shows my taste is pretty consistent! I love the way the dress came out. 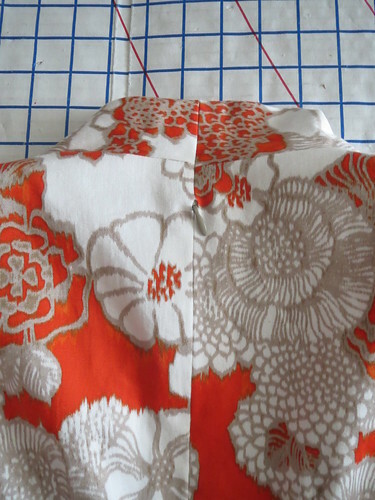 It is not perfect--it is a little loose at the armscye (which I really don't understand, because the top with sleeves is more on the too-snug side than the too-loose side); the front drapes slightly askew/agape; and I'm honestly not sure what's going on with the back waist--the pattern I started from had a swayback adjustment built in yet somehow it needs another 2 inches taken out. 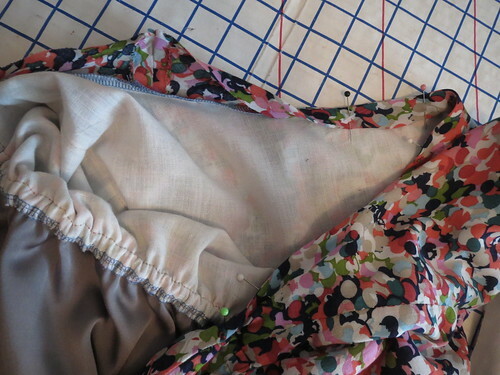 A full muslin and another round of pattern adjustment probably would have fixed those things. 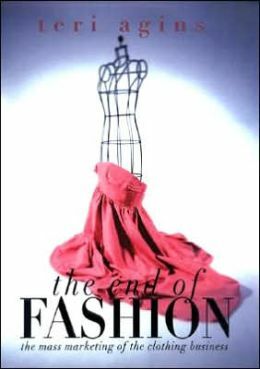 But I've always considered it paradoxical to put so much careful effort into special occasion dresses that will be lucky to see five wears rather than wardrobe workhorses that will be worn a couple times a month in season for five years. Not perfect is fine with me.